Life, Liberty, and the Pursuit of Elegance: Europe 2011: Part 3 Driving in France and Politics! Europe 2011: Part 3 Driving in France and Politics! I rented a really nice mini cooper, with the disadvantage that I didn't really drive stick... so I learned how to work the car in the middle of Lille, which isn't a small city! I finally left the car in Lille for a couple minutes so I could buy a bluetooth headset at the FNAC. My phone got messed up at my grandmother's and I figured that even if the unit couldn't produce sound, it would likely still work with a bluetooth headset if it was only the DAC on the motherboard that was bad. Thankfully, I was right! To get to the political conference, I had to wake up extremely early and sneak my way out of my grandmother's home, without waking up anyone! This is the sunrise on the highway to Paris. My attempted route... from Nord-Pas de Calais to Dourdan in Ile-de-France, and finally arriving in Paris.... it was supposed to take about 3.5 hrs to get to destination 'B' and then about an hour or so to get to 'C'... the reality is I probably took at least 4 hours to get to Dourdan and then at least 2-3 to get to Paris, because I misread the signs and ended up in horrible traffic jams caused by 5-7 car pileups! Oh... 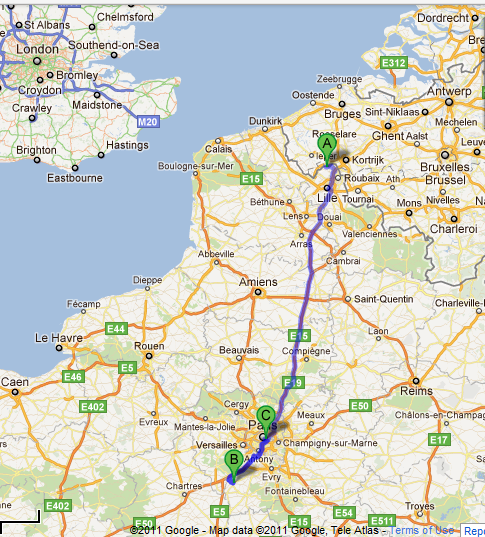 I nearly forgot... the speed limit on French highways is 130kph... aka 80mph! Pretty epic! Waving the flags, waiting for Dupont-Aignan to arrive! Everyone had their cameras out and people were making tons of noise! After welcoming Nicolas Dupont-Aignan, we all sat down and he gave an epic speech, tearing in to the current French political establishment and European Union policies that hurt everyone in France and Europe. It was a very good speech and well delivered! Sadly there wasn't really time this year to take a real picture at the event, so I took a self-pic in the parking lot before leaving. Everyone was parked everywhere... this place really needs to add a garage or something for when this conference occurs! And after sitting in bumper traffic for 2-3 hours, I found a restroom and the car rental agency! This is me before returning the vehicle. I took the wrong highway direction somehow, had to turn around, and then got stuck on the peripherique and then couldn't fin the entrance to the right garage at the station! It was a mess! 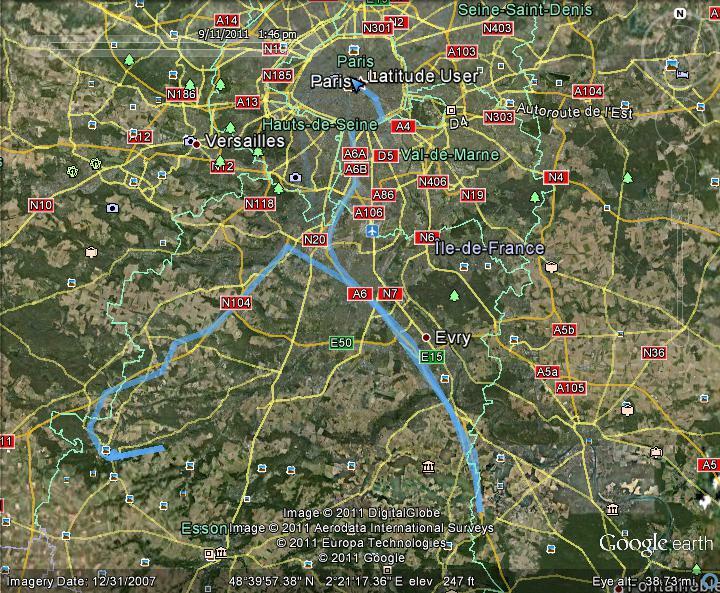 [Update] Here is the route I actually drove from Dourdan back to Paris... notice the complete detour I took to the south-east for no obvious reason! Seems like a fine day the in France. It is just wonderful to drive around and see beautiful sights there. The car that you used looks cute. My International Week in DC!